Sorry for being MIA but I have been pretty depressed for the last couple of days...I still have no car =(. It turns out that they need to replace my engine which is going to cost me 900 bucks and let us NOT forget the $100 from when they towed it. 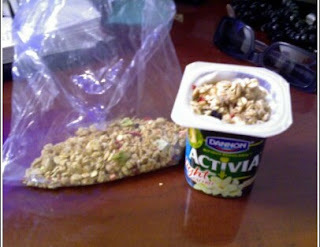 This morning for bfast I had Dannon ff Activia, Kashi Granola, and coffee with ff milk and splenda. Sorry about the car troubles!! Hope all goes well!!! I am really sorry about your car. I hope you are able to get some sleep, it is really important for you girly! Although I know how bad news can somehow sabotage everything, I am sure this will all work out, it always does!